At what age is body glitter inappropriate? 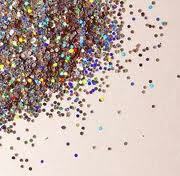 Anybody who has read this blog knows of my affinity for glitter. And that shiny objects draw me like flies to s*#t.
As I walked into a local festival last weekend to meet up with an old friend and her circle, a shiny, sparkly lady headed my way. Stunned, I had to mentally force myself to close my mouth and avert my eyes. She was one of those ladies that from a distance look like a teenager, but as the pseudo-teenager got closer, it was more like…Oh? Oh…she’s old. Which is funny, because if she had been dressed age appropriately and with a little less sparkle, passersby would have thought, Oh…what a strikingly attractive woman. The sparkly lady wasn’t old—maybe 40s, or 50’s. She just looked too old for her overdone, young presentation. I do take notice of presentation these days, in ways I did not when I was married. I am trying to figure out how to be single—because I haven’t been in a long time. I met my ex-husband when I was 15, began dating him a few weeks after turning 16, married him at 21 and our divorce was final last year—just before I turned 40. While going through the divorce, I dated an incredibly wonderful single father with three kids for a while. Which all adds up to my having done little socializing on my own. Very little. So I study others in an effort to figure this ‘single thing’ out. Not nearly where I expected to be!! Kind of like taking a class in school—except in school I really wanted to learn new things. Thrived on it. I am now doing an Independent Study called and Suddenly Single Middle Aged Woman 101. And quite frankly, it isn’t a class that I wanted to take. Nor was it even my idea to sign up. Yet here I am. Breaking down the look of another. Which is absurd given that I am NOT the most socially experienced, single person around. That is slowly beginning to change. More often, I am invited to go out—and I inevitably meet new people. And so last weekend, I found myself with social plans. Again. And yet again, I hadn’t given any thought to a ‘going out’ wardrobe. Or that I don’t have one. With minimal selection in my tiny closet, I went down to the basement to see if there was anything clean in the dryer. No luck. Mostly, everything was dirty on the laundry room floor, separated into piles by color. I threw on a pair of classic, tailored denim shorts and a black Eddie Bauer t-shirt, mainly because they were clean. (I hadn’t yet worn them this summer—which is why they were clean) I slid my feet into my black, sequin flip-flops thinking I looked reasonably okay. Of course, I fluffed my hair. I was a teenager in the 80’s and there is only so much straight I can tolerate. A little volume is acceptable in 2011, isn’t it? Not that I leave the house with much lift at the roots after my daughter uses both hands to smooth my hair down, close to my head—its like putting my head in a vise. She takes care of me like that. Are you beginning to see my problems? I’ve got to deal with the empty ring finger. It is without the wedding rings I wore for 16+ years. Up until a couple of years ago, I was part of a couple—for over 20 years. People have told me to put a fake ring on that finger. But that feels like trying to be somebody I’m not. I already did that and I won’t do it again. The alternative—the empty hand—creates other difficulties, but feels more right. This is NOT what I look like. Not at all!! It is also my personal hell in many ways. Even as a child, I couldn’t stand people looking at me. I prefer to fly under the radar. I dance from one end of my house to the other—but hate dancing up on a stage in public. Being divorced sometimes makes me feel a little like I am on display—which is not at all my thing. And which explains why getting all fixed up to go out feels awkward to me. 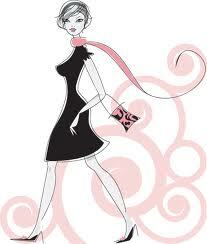 How does one strike a balance between looking nice and attracting attention? Maybe this is why I was so perplexed by the sparkly lady…because she was put together in a way that would never suit me—or my personality. She was like a beacon in the night with all of her shimmer. Almost like a human glow stick. She screamed Look At Me—while I much prefer to fade into the background. It seems more unfair to me that men get better looking as they age. Women find them more attractive. They flock to middle aged single men. Gray hair and laugh lines are distinguished. A little (or even a not so little) gut only adds to their charm. And men’s knees don’t drop as they age. None of that seems to be the case for mature women. Which might explain why so many resort to wearing small, teenage clothing and to dying their hair funky colors in an attempt to match the hair color of their youth—if they even remember it! And some dive into bottles of body glitter. Possibly, these are attempts to draw the eye away from the parts that aren’t quite where they used to be? The ones heading south, but hoisted into proper position by God’s Grace and expensive undergarments. After careful consideration—and another evening learning, I changed my mind. Who am I to say that body glitter is only for those under the age of 12? I am an authority on nothing. That is obvious. If the sparkly lady wants to do the backstroke in body glitter before hitting the town, so be it. She seemed happy. Doesn’t mean I should go swimming in glitter, or that I ever will. I suppose I just need to be comfortable being me. And let others be themselves. This entry was posted in Dating after Divorce, The other Side of 40 and tagged dating by Amy Lauria. Bookmark the permalink.